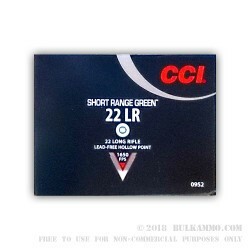 This 22 LR cartridge from CCI’s Short Range Green line of ammunition features a 21 grain truncated cone hollow point lead-free bullet. As the projectile is made from a compressed copper/particle mix, and is good for the environment but only remains effective at ranges of up to 50 yards. (It’s maximum range is still .75 miles, however.) Its truncated cone shape facilitates in feeding, and typically prevents jamming when used in a semi-automatic weapon. Take note, though, that this round may not function in all semi-automatic firearms -- bolt actions are best for it. Also note that this cartridge is intended for ANSI sporting chambers only, and can not handle match chambers. This fast bullet travels at a muzzle velocity of 1,650 fps, but its design makes it only issue a report about ¼ as loud as another similarly sized cartridge. That makes this cartridge perfect for backyard plinking, where it won’t seed your lawn with lead or disturb your neighbors. This ammo is the best to me...http://www.bulkammo.com is Trusted by me.